It's Postpartum Week at Amy Wraps Babies! This week we're focusing on the intersection of babywearing and all the other stuff that happens when a new person is welcomed into the family. We'll be sharing a bunch of inspiration, resources, and support about postpartum and gathering it all for future reference here in this pinned post and online at the link below. "Postpartum" is defined for us this week as any period of time following the welcoming of a new family member, no matter how you measure that period of time (for example, my son is almost a year old and I still consider myself in some extent of postpartum), whether or not you were a gestational caregiver (partners and adoptive parents have postpartum considerations too!) and whether the new family member is an infant or older. Here's what to come during Postpartum Week! As we progress, links to resources will be gathered here as well. Sharing stories! Babywearing has shown to be a very successful tool for postpartum. We'll be sharing several stories across social media. Ergonomics - what physiological considerations need to be made for postpartum babywearing, both for baby and caregiver? Live Videos - a couple therapeutic and super comfy carries for you and baby! Thank you to Lalu Wovens who have provided a couple great wraps for us to use this week! **​Image of Amy, a thin white woman with dark hair, standing in front of an evergreen and wearing her baby on her back in a pink and blue geometric woven wrap. 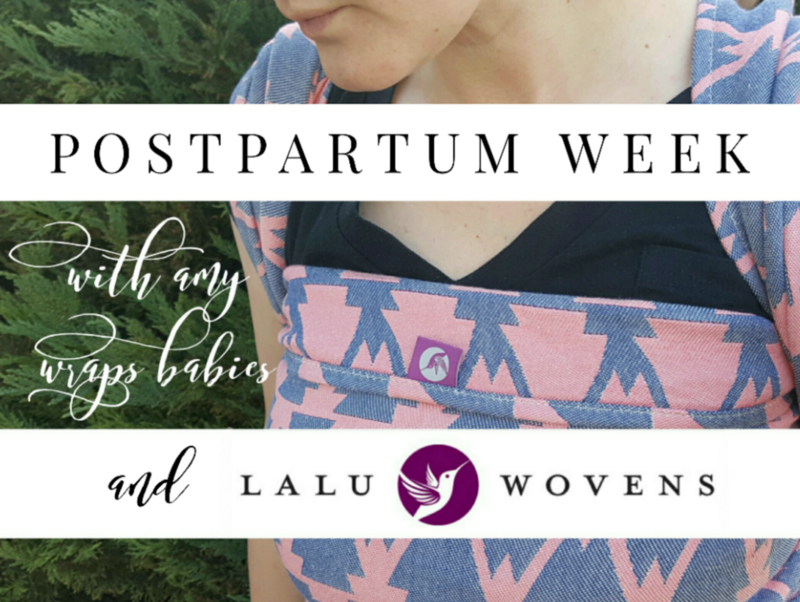 Text on the image reads quote, Postpartum Week with Amy Wraps Babies and Lalu Wovens, end quote.